We offer clients our range of Four Poles Windbreak With Matching Coloured Carry Bag which are made of high quality Printed fabric on 100% cotton yarn dyed woven fabric and treated wooden poles. 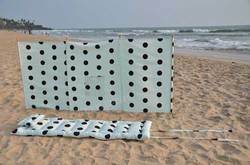 This Windbreak is available in attractive colors and designs and we even accept orders for both printed windbreaks and matching beach mattress according to the customer’s preferred designs and colors. Clients can contact us to get complete details of this product regarding price, Minimum quantity, Delivery schedule, etc. Weight of the beach mattress : 2.500KGS.